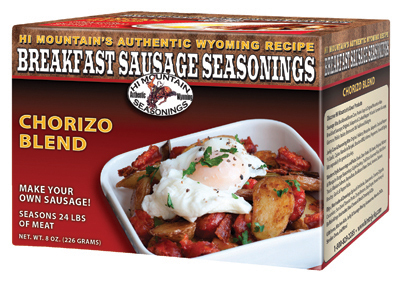 Hi Mountain Jerky's Chorizo Blend Breakfast Sausage seasoning is a delicious blend that gives breakfast an spicy, south of the border flair. This lively sausage is fantastic in omlets, burritos or anything you like. Designed to mix with ground pork, or a combination of pork and beef or wild game. Each Hi Mountain Jerky Chorizo Breakfast Sausage Seasoning kit seasons 22 lbs of meat, one lb at a time if you choose. The great thing with making your own tasty sausage is that you get to pick the ingredients. Make your sausage using pork mixed with beef or wild game—deer, elk, buffalo, antelope. After you have made your first batch of sausage you can experiment adding your personal favorite tastes such as garlic, peppers or cheese. With Hi Mountain’s quality seasonings and your personal touch you won’t settle for anything but homemade again!